Yes! An all new self-published Theo Ellsworth zine! 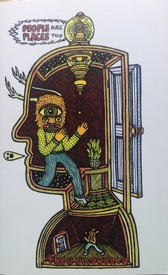 39 never before published pen and ink drawings on the theme of the spatial nature of self-image and identity as only Theo Ellsworth can envision. A treat for the eyes – and the mind! Special limited-time introductory price for fast-acting fans.